DALLAS, TX — The Dallas Cowboys (3-5) were embarrassed on primetime television Monday night by the Tennessee Titans. The Titans (4-4) ended their three-game losing streak, basically shutting down the Cowboys attack before 90,000 plus at AT&T Stadium. 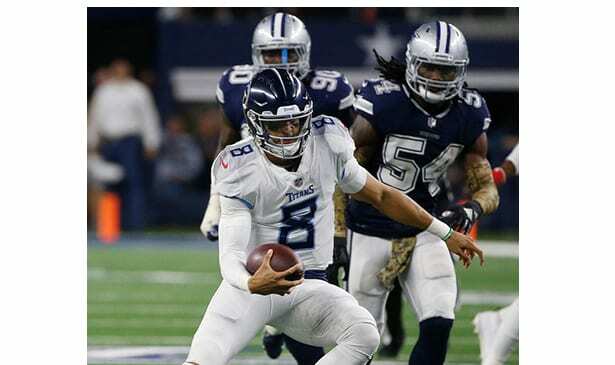 Marcus Mariota and his troops defeated the Cowboys 28-14. “It’s disappointing,” said Prescott. Both teams were coming off a bye week, but the trade with the Oakland Raiders for Amari Cooper was the main topic of discussion leading up to the game. On Dallas’ second play from scrimmage, Cooper caught his first pass as a Cowboy for an 11-yard gain. He later caught his first touchdown shortly after DeMarcus Lawrence stripped the ball from Mariota. The two-time Pro Bowler finished the game with five catches for 58 yards and a TD. The Cowboys’ defense started fast, and it looked like Dallas would blow Tennessee right out of the building. However they only led by seven after Mariota’s early miscues. On the Cowboys’ third possession, after Mariota fumbled on Tennessee’s first two possessions, Prescott forced a pass on second down to a double-covered Cooper in the end zone from the Titans’ six-yard line. Safety Kevin Byard’s interception sparked the sluggish Titans. Byard, then, very disrespectfully, ran directly to the the star at midfield, and stood square in the middle of it, showboating and dancing; just as Terrell Owens (T.O.) did at old Texas Stadium 18 years ago. The flashback for the Cowboys was just as disheartening as the original. Cornerback Byron Jones didn’t like it one bit, coming over and hitting Byard and the group that joined the celebration, just as George Teague did to Owens. Nevertheless, Owens seemed to get a kick out of the whole thing on Twitter. “I was actually expecting somebody to knock my head off,” said Byard following the game. It’s safe to say the Titans spoiled Amari Cooper’s Dallas debut. All the Cowboys’ faults were on full display. The defense gets a turnover. They’re up by seven. They get deep inside the red zone, but hand the ball right back to the Titans. That’s a 14-point swing. Before that, on the game’s opening drive, the Cowboys missed a 38-yard field goal. The Titans answered with a 15-play, 80-yard drive to tie the game at seven. Mariota and the Titans converted 11 of 14 third down tries. Mariota broke a 14-14 tie in the third quarter. On a tremendous play fake to Dion Lewis he delivered a seven-yard shovel pass to Jonnu Smith that put the Titans ahead 21-14. The Tennessee defense disrupted Dallas’s offensive flow, creating and securing turnovers along the way. On the Cowboys’ first second half possession Prescott was strip-sacked by Jayon Brown, fumbling into the hands of Wesley Woodyard. From there, the Titans pitched a second half shutout. Mariota did supreme damage to the Cowboys defense. He was methodical in the passing game and his nine-yard touchdown run ended the Cowboys’ chances with a little over four minutes remaining. Ezekiel Elliott finished with only 61 yards on the ground. Prescott was 21 of 31 for 243 yards and two touchdowns. Mariota was 21 of 29 for 240 yards, accounting for three total touchdowns. He also had 32 yards rushing, and didn’t throw an interception. Lewis had 62 yards rushing and 60 yards receiving, along with a TD. The Titans are back home this weekend versus Tom Brady and the AFC East leading New England Patriots. Game time is noon Sunday.